Below you can view all the homes for sale in the Lakestone subdivision located in Woodstock Georgia. 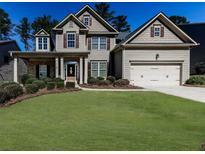 Listings in Lakestone are updated daily from data we receive from the Atlanta multiple listing service. To learn more about any of these homes or to receive custom notifications when a new property is listed for sale in Lakestone, give us a call at 404-998-4112. Flat Fenced-In Backyard. Great Location-Restaurants, Shops & Highways. MLS#6538957. Beacham And Company Realtors. Seller Offering $3K Carpet Allowance. Move In Ready. Get Yours. MLS#6522214. Re/Max Around Atlanta Realty. This Home Is Conveniently Located Close To Milton, Woodstock, And Marietta. Schedule Your Showing Today! MLS#6515662. Keller Williams Realty Northwest, Llc.. Unfinished Basement Provides An Opportunity To Make It What You Want. MLS#6511809. Palmerhouse Properties. Excel Access To Historic Roswell And Woodstock Downtown. MLS#6510166. Harry Norman Realtors.